Summer is finally here and with it comes a set of new ingredients, flavors, smells and tastes. 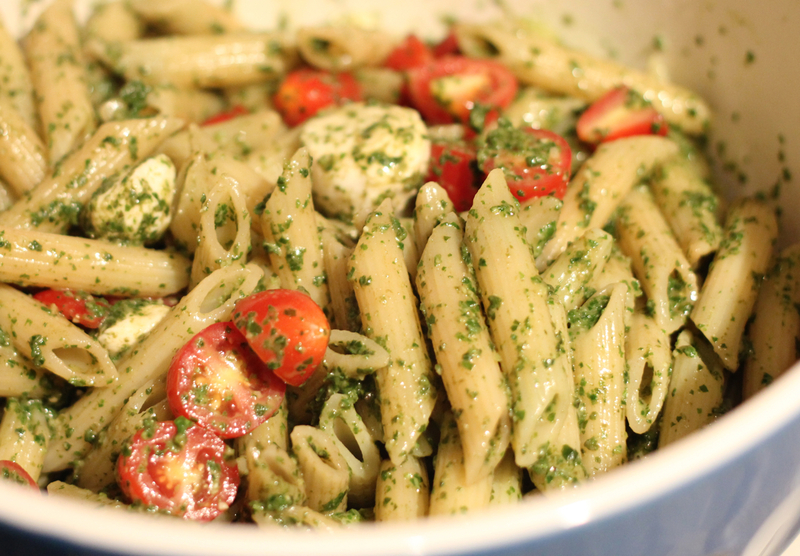 Personally, I think summer rocks—few reasons: watermelon, apricots and fresh, delicious basil—hence homemade pesto. 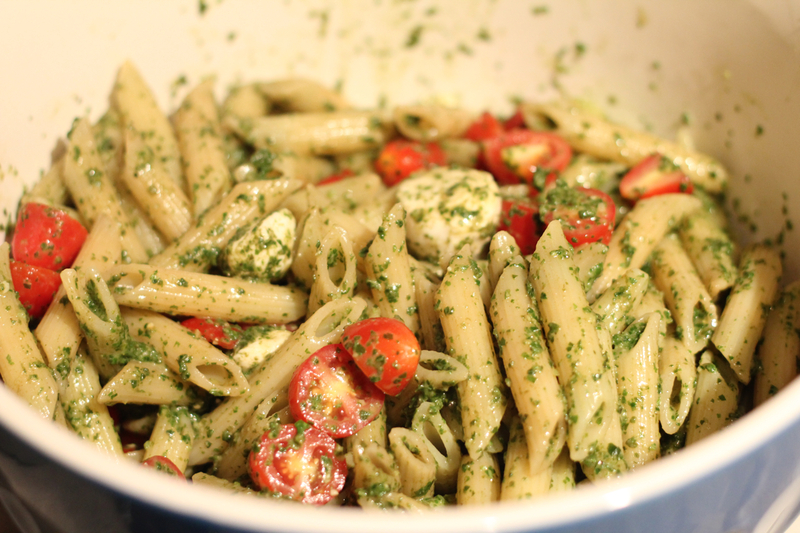 Every chance I get, I made pesto and one of the easiest and tastier summer pastas is with fresh pesto, juicy Roma tomatoes and ciliegine (tiny mozzarella bites). The most important ingredient is, for course, the basil. I buy mine (I wish I had enough of it on my tiny fake balcony) at the Charlottesville Farmers Market. 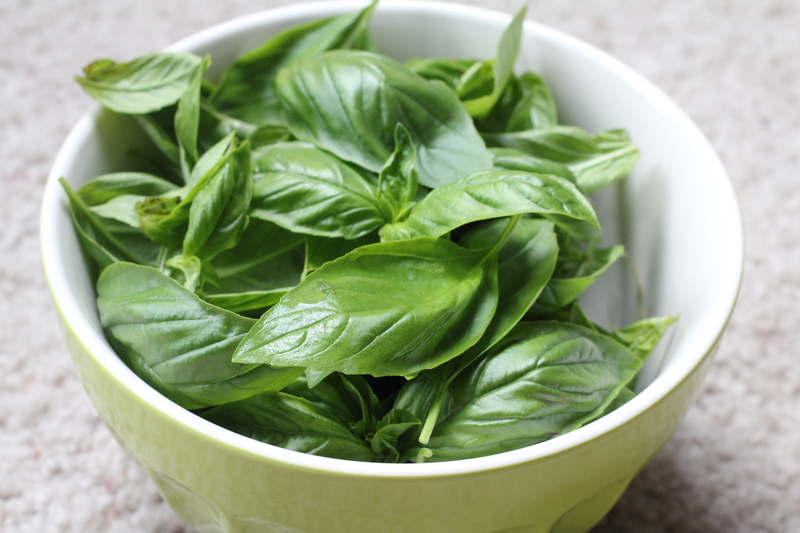 For this recipe, thee big bunches of fresh Genovese basil is just perfect. To make the pesto, after washing the basil bunches, pluck the leaves and put them in the food processor (the smallest leaves are the juiciest). 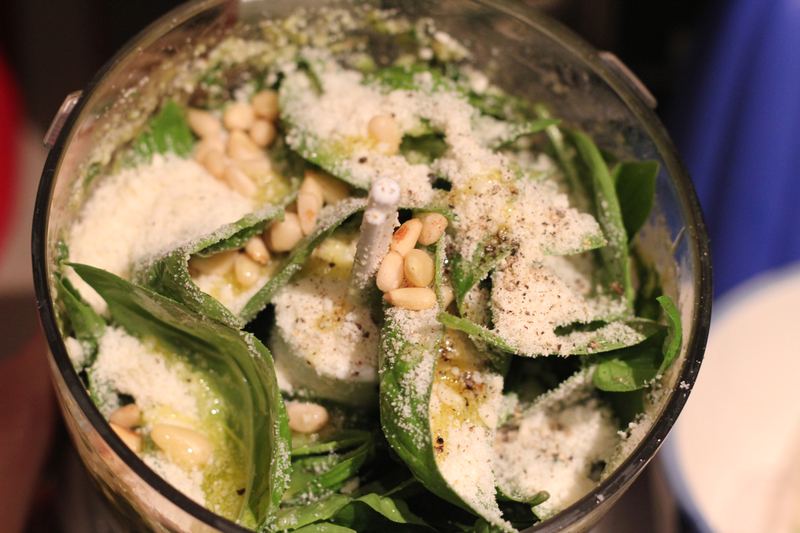 Add Extra Virgin Olive Oil, Parmesan Cheese, garlic pine nuts, salt and pepper. Grind the mixture and taste it. I like my pesto to be garlicky, so I usually add 3 or more cloves. For a tart flavor, add more Parmesan cheese than you normally would: It adds a tangyness that marries perfectly with the sweetness of the basil. Next up: pasta, tomatoes and mozzarella. Fill a pot with water, put it on the stove at high heat and bring it to a boil. In the meantime, wash and half a good 2 cups of Roma tomatoes. 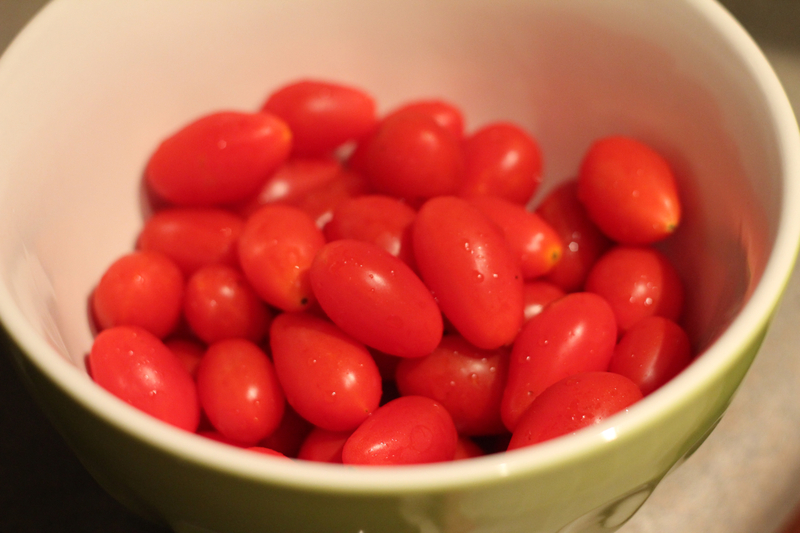 These have much better flavor than the bigger, salad tomatoes. 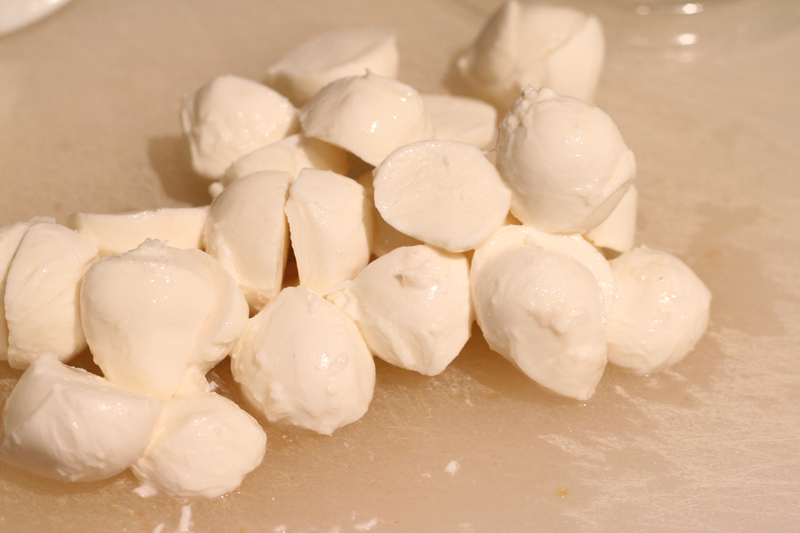 Big flavors, apparently, come in small packages.The ciliegine, small bites of mozzarella, go through the same process. Once the water is boiling, add the pasta. I prefer to use Penne, a short and sturdy shape…it holds strong flavors very well. Cook the pasta for 10 minutes, drain it and put it back into the pot it cooked in. Add the pesto and the other ingredients and stir it until the mozzarella is melted. Serve it right off the stove or cold. It’s that simple. Enjoy! Ho appena riaperto twitter dopo millemila anni e guardo cosa ti trovo? uno yummy blog di cose buone e belle italiane! E di questi tempi se ne trovano poche!